The information for this month is intended to take the stress out of traveling during this season. Whether your trip is already planned or you’re searching for last-minute deals, this piece offers tips to help you reduce the stress of flying or driving. Additionally, I share important advice on how to stay healthy and how to ease traveling with small children or pets. 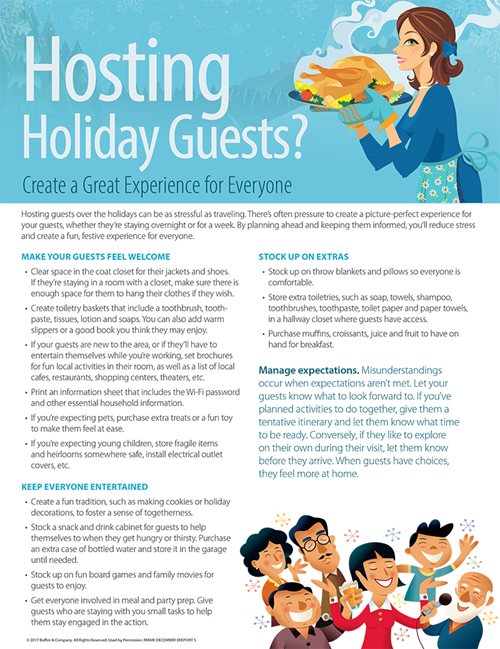 Don’t let the stress of traveling, or hosting travelers, dim your holiday spirit; follow these tips and you’ll arrive at your destination happy, healthy and ready to celebrate with your loved ones.